All inclusive price, includes meet and great on arrival, linen and towels and secure underground parking. We enjoy exploring the South of France and with the train at our door step is perfect for day trips to Nice, Antibes, Monaco, Italy, Aix and Avignon .It is our special place to relax and chill out and our family love bringing their friends to introduce them to the Riviera and the Cote D'Azur. Bath with Shower, Double vanity basin with heated towel rail and hair dryer. There is a separate WC with hand-basin. The patio , complete with BBQ connects with the living room and kitchen . The apartment is equipped with an iron and ironing board a folding outdoor drying rack for beachwear and towels. Linen and bathroom towels are provided for up to four people. There is an additional charge for more than 4 people. Please bring your own beach towels. Perfectly located and excellent all round. From pre-holiday contact to final checkout, the process was seamless with prompt and helpful responses from both the owners and the local agent. The location is perfect – quiet neighbourhood with everything very close by – beach, shops, restaurants, and excellent train and bus links. You can easily travel to other parts of the Cote d’Azur and inland to beautiful perched villages like St. Paul de Vence from here. This is a beautiful, spacious apartment that is fully equipped with everything you need. We enjoyed the large balcony where we often dined out in the evenings. The air con, good WiFi and underground parking were a godsend. You are spoilt for choice with the various sandy beaches that run all along the 5 km coast here from Cannes to Mandelieu, many offering water sports and snack bars. It’s just a few minutes walk to the beach, which is terrific as parking is limited on the beachfront. We often visited the lively restaurants in the Old Port area for dinner, which is a leisurely 30 minutes walk along the beach – or on occasion we took the short bus ride (7-10 minutes). All in all, we had a great holiday here and plan to return. And steak tartare! Grt quality & almost half the price of downtown or beach side restaurants but hey your in Cannes.... Definitely have dinner on the seafront.. Sand underfoot beautiful sunset utterly romantic. We went to a new place-name escapes me but it's at cabin 15 as u walk towards Cannes. On the other end we can recommend La Cabonon land mark cabon 33. Lunch only I think. Temporary bus stop at Church takes u into Cannes in 10 mins 1 euro 50 ! Best stop for shopping La Croisette for Rue D'antibes (je t'aime!) & lots of streets off it. Rue D'Antoine in evenings bursts into action with loads of restaurants... They can b pricey. Look at other streets for same quality less cost. The whole coastline can be explored by train. On this trip we did very little but you can go all the way to Vintimille on SNCF. Which has a great big colourful crazy market. ITs easy to hang out in this apartment. lovely bright fresh decor. Balcony is big enough for bar bq & is near enough & far enough away from the low hum of daily French life. I noticed a new sofa/ lounger & 2 chairs. It's nice to see standards maintained. Previously I didn't pay much attention to the pool as sea is so close by but it's lovely. Quiet & clean. Highly recommend this place. Bonne Vacances ! Apartment is really nice, makes you feel like you're living in a proper French community rather than a contrived tourist area. Location is great, 5 mins walk to a supermarket, great boulangerie, other shops and several restaurants, same distance to the beach which is lovely, especially late afternoon after a day out. Transport to central central Cannes is easy by bus or a pleasant 40 minute walk. Trains to all over the area easy from Cannes station of local Cannes La Bocca station. Apartment very comfortable, nice balcony, large lounge and decent kitchen. Pool on the complex is nice too. Air con works really well which is a bonus when it's hot outside. Quite simply, the apartment exceeded our expectations...and then some. Spacious, relaxing, comfortable, indeed a home-from-home. By the way, no picture of the pool does it justice: an absolute cracker, sun virtually all day and if you're lucky (as we were) you might have it completely to yourselves, as the permanent residents don't seem to use it. WE WILL BE BACK. My wife and I are just back from a second wonderful holiday in Cannes at this apartment. This time we were there in the Winter months. As before, the owner was very helpful, offering lots of advice and helping us with any questions. The local agent continues to be very pleasant and attentive. The express 210 bus transfer from Nice airport to Cannes is efficient and quick or if you arrive by train the new, stylish train station is a great transport hub. The apartment is warm and cosy in Winter. This time we ate in a bit more often and we found all the facilities in the apartment made this an easy option. The local supermarket and boulangerie sell quality produce which is fresh and tasty. The boulangerie in particular is a delight with its wide selection of fresh baguettes, cakes, pastries and good coffee. The people there have good English so there is no need to worry if your French is scratchy. We love this apartment. It is clean, modern and beautifully furnished. The complex has all the benefits mentioned after our last stay - small, secure and well maintained, with pool and underground parking and an excellent location. 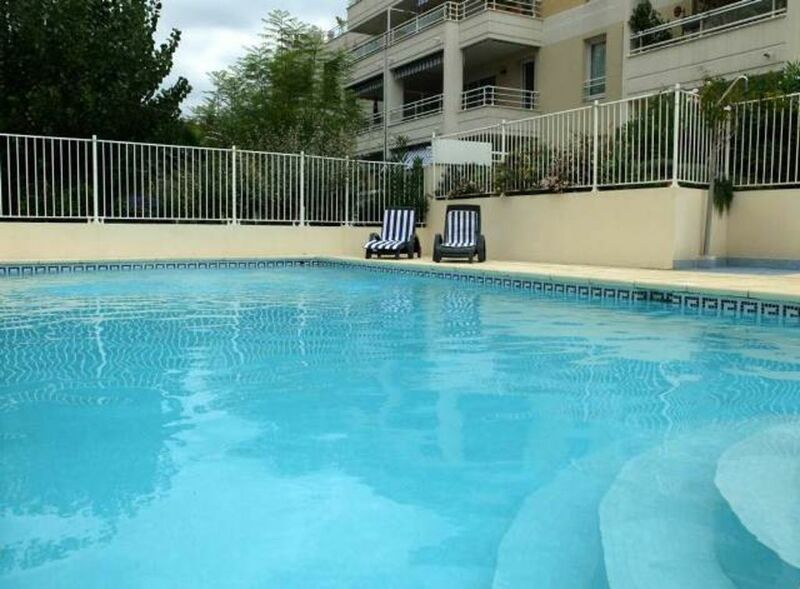 Downtown Cannes and all that it offers is easy to access from the apartment. The location is a short walk from the train station and is on a high frequency bus route so it is easy to do day trips to many lovely Cote d’Azur locations. We found the great tranport system made a car unnecessary. This time we discovered the fantastic Vintimille Friday markets where leather goods and cashmere are abundant, wandered the narrow, cobbled streets and art shops of hilltop town St Paul de Vence and enjoyed seeing the urbane, well dressed residents of Beaulieu sur Mer go about their daily lives as we sipped our drinks on the boulevard. We are return customers to this lovely apartment and I’m sure we will continue to stay there whenever we have the opportunity to come back to Cannes. We have recently returned from a wonderful holiday here, Sept 2017. The apartment is situated in an excellent location – walking distance to beach, train station, shops, and market, yet in a quiet spot. The apartment has everything you could need. It was clean, well maintained and furnished to a high standard…home from home really. We popped around to the local boulangerie for fresh croissants to start the day. We enjoyed many evenings eating out on the terrace or enjoying the many lovely restaurants in Cannes. We took two train trips one to Nice and another to, Monaco and over the border to Italy for the Friday market. We also spent time just chilling by the pool. The owner Anne and the local agent Carol were very helpful and responsive. We will definitely come back here. This elegant apartment is located in a friendly neighbourhood which, while in an urban setting, retains the charm of an old French neighbourhood. Minutes walking distance (No Hills) to the 'Plage du Midi', widely acknowledged as the best sandy beach, stretching along the Bay of Cannes connecting to the Croisette. There is a variety of shopping in the neighbourhood with cafes, restaurants, fruit and vegetable markets, patisserie, and a late-opening convenience store around the corner. A car is not necessary, though secure underground parking is available, as the area is well-serviced by trains (5 mins walking) connecting to all the sights of the Riviera.. A refreshing walk along the beachfront Promenade connects to the Old Port / the Palais de Festival and exclusive Rue d'Antibes shopping. Serviced by a high frequency bus corridor, it is an ideal location for holidays in the region as well as for those attending the FILM FESTIVAL and conferences in Cannes. The rates include linen and towels and complimentary welcome pack. Rental rates exclude the Film Festival which is available on request. A deposit of 25% of the rental is required to confirm the booking. The balance is payable 4 weeks in advance. A returnable security and breakage deposit of € 300 is required on arrival and returned on leaving. ..